Located at the heart of the Sta. Rita Hills along Santa Rosa Road, the adjacent Sanford & Benedict and La Rinconada ranches and their vineyards combine to make up the Sanford Estate. 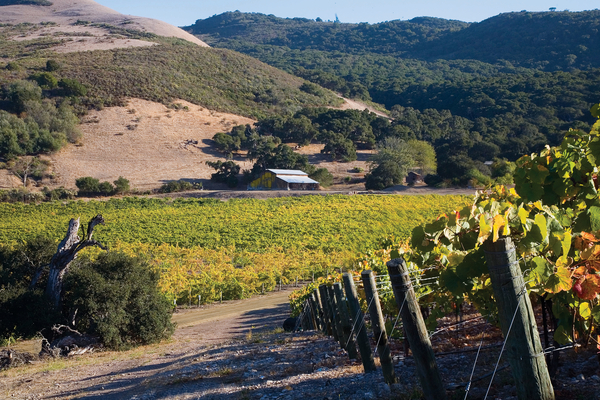 Located 10 miles inland from the Pacific Ocean, the Sanford estate benefits from its central position within a unique geographic anomaly – the east-west traversing Santa Ynez Valley. 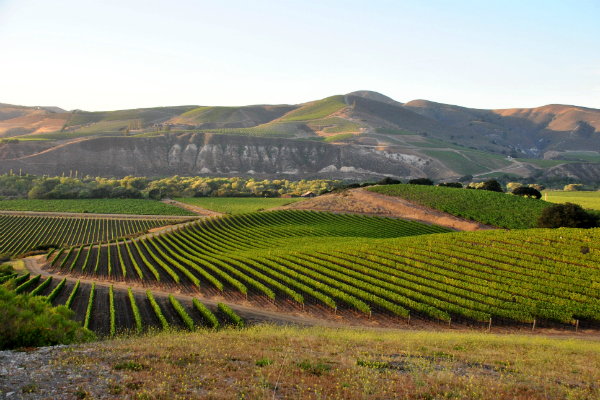 It is the east-west orientation of the Santa Ynez Valley which provides a pathway to the Pacific Ocean and its maritime cooling influence, allowing cool air to be drawn inland. This creates the perfect conditions for growing Pinot Noir and Chardonnay and it was this anomaly which was discovered by Michael Benedict through his research, data collection and analysis. The Sanford Estate Vineyards are farmed and harvested in more than 40 individual blocks, allowing us to highlight the subtle soil variations and microclimate in both farming and vinification. Our winemaking is the constant between the two vineyards so the differences in aromas, flavor, texture and mouthfeel of our single block wines are directly related and attributed to the unique terroir of each vineyard block. True representation of the place and true representations of the vineyards. Named one of the five most important and iconic vineyards in California by Wine Enthusiast, the Sanford & Benedict Vineyard is renowned for both its historical significance and the continued quality of the fruit it produces. First planted in 1971, this vineyard is home to the oldest Pinot Noir vines in Santa Barbara County. Today, within this vineyard we still farm 51 acres of vines from the original planting. Another unique aspect of these original plantings is that they were planted on their own root stock (vitis vinifera) and these “own rooted” vines have flourished for more than 45 years. This vineyard is blessed with calcium rich clay loam soils with a lot of fractured shale and chert- a result of the sloughing off of the top half of this mountain over 1million years ago. Primarily planted to Pinot Noir, the Sanford & Benedict vineyard features more than 20 individual blocks and 11 different clones. Planted in 1997, La Rinconada sits adjacent to the Sanford & Benedict Vineyard. The same soil and climate condition that make Sanford & Benedict an ideal spot for Pinot Noir and Chardonnay exist in the neighboring La Rinconada Vineyard. Home to 20 vineyard blocks and 12 clones, La Rinconada is also primarily Pinot Noir, complemented by Chardonnay. The lower portion of La Rinconada is a sandy loam, which transitions to more clay loam mixed with diatomaceous earth and shale on the hills closer to Sanford & Benedict.